Brian White (42) of the Red Bulls celebrates his goal. (@NewYorkRedBulls). This weekend, both New York-area MLS teams were on the road and their both earned a point as they tied their games. 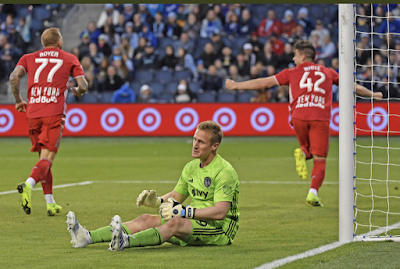 On Sunday night, the Red Bulls earned a point with a 2-2 draw at Sporting Kansas City, while on Saturday night, New York City Football Club tied Minnesota United FC, 3-3. The Red Bulls and NYCFC each have five points on the season, and are in a three-way tie with Atlanta United for ninth place. The Red Bulls' record is 1-2-3, while NYCFC is 0-5-1 and still looking for their first victory on the season. Kansas City got the scoring started in the 24th minute when Johnny Russell scored his fourthgoal of the season on a feed from Nemeth and Graham Zusi. It stayed that way into the second half, and the Red Bulls tied it in the 52nd minute when Daniel Royer scored him second of the season. It was Royer's 26th career league goal and moved into a tie with John Wolyniec for seventh all-time in franchise history. Cristian Casseres, Jr., and Bradley Wright-Phillips got the assists on the play. It was Wright-Phillips' 25th career MLS assist to move into a tie with Mark Lisi for sixth all-time in team history. Cásseres, Jr. tallied his first career MLS assist in his sixth career league match. 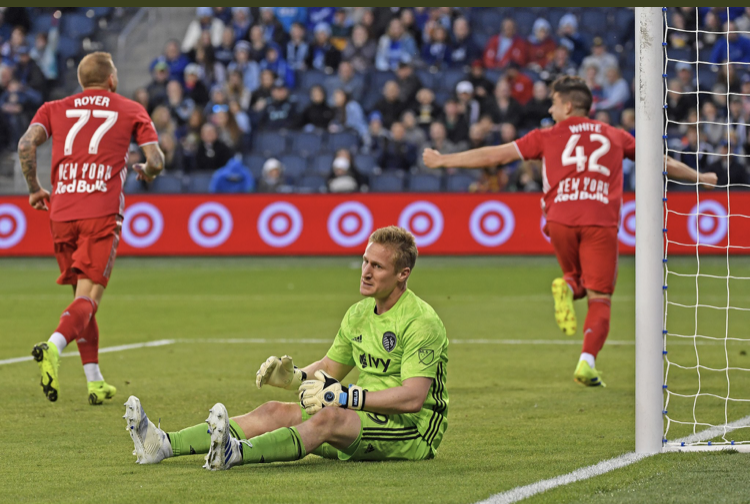 In the 75th minute, Kaku, from the far sidelines, sent a deep pass into the 18-yard box for Brian White, who dove and headed in the go-ahead goal to make it 2-1 Red Bulls. It's was White's first MLS goal of 2019 and his second career league goal in six career MLS matches. In the 88th minute, SKC was awarded a corner kick, and they sent the loose ball into a crowded box where Gianluca Busio picked it up and finished for the equalizer. This draw broke a three-game losing streak for the Red Bulls. The goals came fast and furious early in this one with four goals coming within a seven-minute stretch in the first half. Minnesota got on the board in the 13th minute when – MIN – Osvaldo Alonso scored an unassisted goal. NYCFC tied it in the 16th on a goal by Valentin Castellanos, which was assisted by Ismael Tajouri-Shradi, Anton Tinnerholm. Two minutes later, Tajouri-Shradi gave NYCFC the lead. In the 20th, Minnesota tied it when Angelo Rodriguez tied it at 2 on a feed by Ethan Finley and Jan Gregus. Minesota took a 3-2 lead in the 32nd minute when NYCFC goalkeeper Sean Johnson took a heavy touch off Ebenezer Ofori’s back pass and put the ball into his own net. In the 64th, Tajouri-Shradi got his second of the game to tie it at 3, which would be the final. NYCFC Head Coach Domenec Torrent said of solving their goal-scoring scoring issues, but also conceding goals, "This is soccer, sometimes if you want to attack all the time you have problems when you have to defend. I am very proud with my players because they fought until the last moment. It was not easy to play here, Minnesota United has a physical team. In the second half we played better. One point is not enough for us. But I told my team, ‘if you are able to play that way in every stadium you will get a point.’ I am happy with a point."